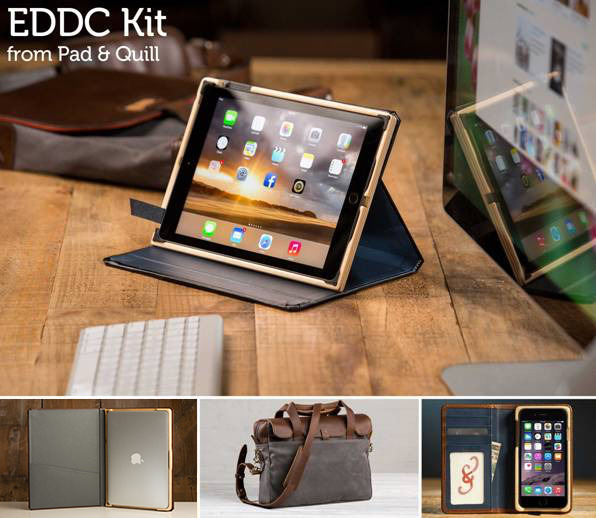 Pad & Quill is partnering with AppleInsider this week to kick off WWDC festivities with a fabulous giveaway bundle consisting of The Briefcase bag, iPad case, MacBook sleeve and an iPhone case of the winner's choosing. To celebrate this year's Apple Worldwide Developers Conference (WWDC), Pad & Quill is giving readers the chance to level up their carry game and win a Pad & Quill Briefcase bag, iPad case, MacBook sleeve and an iPhone case of their choosing —dubbed the EDDC Kit (Every Day Developer Carry Kit). The winner will receive the The Briefcase, which holds up to a 15-inch laptop, features two internal dividers with five internal pockets, and retails for $295. The winner will also be able to choose from a variety of iPad cases, which can fit an iPad Pro, Air, Air 2 or mini. On top of that, the bundle also includes an iPhone case of the winner's choosing —available in a variety of finishes. Since it's WWDC week, Pad & Quill is also throwing in a MacBook sleeve for developers and Mac enthusiasts alike to hold a MacBook, MacBook Air or MacBook Pro. To enter this special giveaway, use the widget below. One lucky winner will receive the EDDC Kit, valued at over $500. The giveaway is open to U.S. residents and ends at 11:59pm EDT on June 20. The winner will be announced on June 21. Looking to buy a new case now? Pad & Quill is also exclusively offering AppleInsider readers $10 off purchases of $39 or more with coupon code Apple10.